American artist and researcher Lyndsey Walsh has spent more than a year playing with stem cells. Ordinarily the domain of embryo and bacteria scientists, Walsh’s stem cells are part of a very different kind of research, for art’s sake. Walsh has been able to explore her obsession with monsters as part of her Masters with SymbioticA, the world’s first lab focused on bringing scientists and artists together in their practice, which operates out of UWA. Her upcoming exhibition Return of the Teratoma will open this Friday, May 4 at the Moores Building in Fremantle, opening up the world of teratomas, organoids and stem cell experiments to the public. JESS COCKERILL spoke to Walsh about dissolving the lines between human and non-human, life and death, science and art. You’ve always been fascinated with teratomas, those horrifying growths with teeth and hair inside. What makes teratomas an interesting subject in art? They have this really interesting culturally entrenched narrative, which has fascinated both artists and scientists and cultural historians throughout time… I was really interested in looking at how that form making happens, and what about that form making makes them so monstrous, compared to other more – not typical, because everything made in the lab is a little bit weird – but more normalised lab forms. They also have this very much attached human narrative to them, because in the history of science they’ve been described as a permanent foetus. When I started my research I was interested in exploring that human relationship. What can we expect to see in this exhibition? The first thing you’ll see is this giant incubator. In the incubator, there’s going to be a petri dish under a wireless microscope, showing this thing called a hanging drop. It’s a technique in embryology and bacteriology adapted for these mesenchymal stem cells (similar to bone marrow stem cells). As they’re suspended, they end up coming together to make these forms and then after the course of about 72 hours, they begin to die, because it’s this very liminal existence they have in these droplets. As they begin to die, the forms start to fall apart. They end up making these beautiful visual images that will be projected in real time to a screen from the microscope. It has this very primordial ooze, liquid feeling about what form making is, in-vitro. A lot of the way you make forms in sculpture, it’s very concrete forms, like clay or lego. [But] when you’re working with stem cells in the lab, the forms you’re making are very liquid. As people move through the space they go into this world I’ve made, and these characters I’ve cast as monsters. It’s been a process in casting these creatures that exist in a lab space, and taking them out of the lab and putting them into a movie, and seeing how that shifts notions about their agency and identity. They don’t fit into this human world anymore, though they’ve come from human cells, and they end up haunting this human world with their monstrosity. What is the hanging drop usually used for, by scientists? The hanging drop technique has been used to study bacterial colonies, or working with embryos, to figure out how they’d normally develop in-utero. You’re trying to get this interesting take on gravity, because gravity makes cells want to grow flat against a surface, so the drop forces them to surrender a bit more… They want to sit closer to the surface of the drop, but there’s nothing flat for them to hang onto. It’s hard to mimic that in other situations in the lab. For being cellular organoids these blobs have grown up to be quite big. If you would like to hear more about their story, join me for my talk at SymbioticA this Friday @3:00pm! In the gallery they’re kindly donated to me from Stuart Hodge’s lab, and they’re rat cells. I usually only do this technique with human stem cells, but in the gallery we’re using rat cells for biosafety. It’s an ethics consideration. Since, in your artwork, you have these cells being formed, and then dying, how do you feel about their status as living things? A bunch of my organoids recently just passed away. I ran out of their food so I had to end their lives, so they wouldn’t starve to death and fall apart. I think the whole journey really made me more interested in how we treat living organisms, in terms of their novelty and use and function, and how we’re so interested in their utilitarian value, mostly in research, but also in the food industry. If you end up looking at a different narrative… you end up noticing different things about them, or new things that make you question the way we do things. 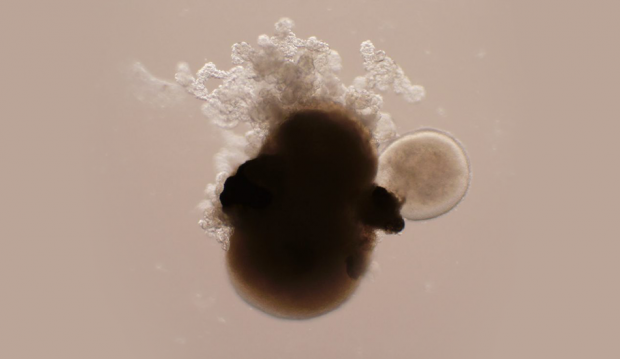 The organoids I’ve created ended up looking really adorable under the microscope, which is a weird thing to say about things under a microscope, made in a lab, but they are really cute. They have beady eye-looking structures, and little blobby bodies. They’re called retinal organoids… they started out as a cluster of stem cells and were manipulated through various techniques to become organoids made up of complex retinal formations, like what you’d find in the eye. So they have these little black dots, where the retinal cells have developed. It’s an interesting and complicated conversation to have around these figures, because they look recognisably cute, in an anthropomorphised way. And I hope that causes my audience to question their ideas about what these living entities are in the lab, and what they can be… There’s really this spectrum of different forms that are living. Do you think it is ethical to manipulate stem cells for the sake of art? I don’t think it’s any less ethical than what people do for science. I was really interested in the materiality of stem cells. They’re treated as a technology within the cell. In stem cell biology there’s even this whole programming language, inputs and outputs. By exploring it artistically as a material, you’re not thinking about it [that way]. It’s a very different way of thinking about things and doing research. But I always think ethics should constantly be questioned, about the way we interact with living materials. I think having artists in the lab is one of the key functions, to constantly question and push the boundaries so you can have these discussions about ethics, and they can be translated into the general public in a way they know how to interact with. Did you feel any sense of being out of place in the lab? Or being the “eccentric artist”? I was expecting to feel like that, but actually all the scientists I’ve worked with have always worked closely with SymbioticA, and they have an idea about what you’re gonna ask, and what directions you might push them in. They’re prepared for you to make things weird. If I wasn’t using scientifically correct language at the time, my supervisor would either take a moment to educate me about what that was, or if I was just trying to describe something aesthetically, he’d try to figure out what I meant. I think SymbioticA is the reason that exists here in Perth.